English author; flourished in London in the latter half of the eighteenth century. In 1773 he published a philosophic commentary on Ecclesiastes which gives evidence of some classical scholarship. The mythology of Greece and of Rome is presented in this commentary in a very clear and concise manner; and the "Anthologia Græca," Ovid, Vergil, and Seneca are frequently cited. 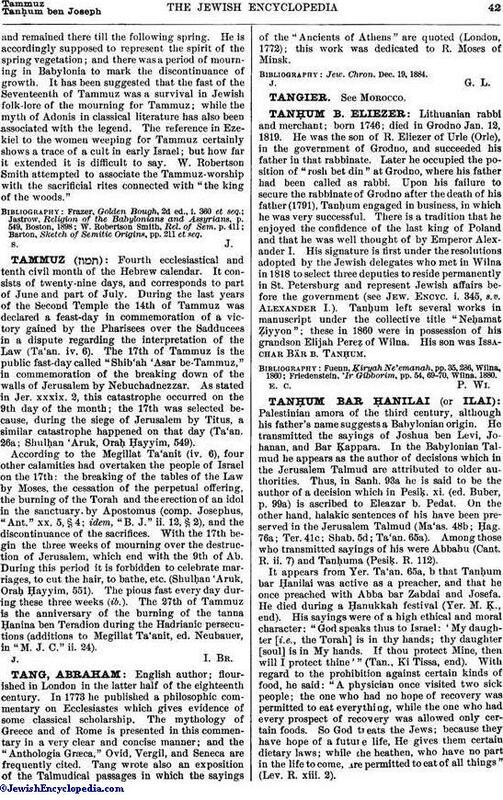 Tang wrote also an exposition of the Talmudical passages in which the sayings of the "Ancients of Athens" are quoted (London, 1772); this work was dedicated to R. Moses of Minsk. Jew. Chron. Dec. 19, 1884.